I hope you had a wonderful week. Mine was very hectic because of the first week of lectures but hoping it will get better next week. Good news is that I started wearing make-up daily so FOTDs are already piling up and waiting to complete the swatches I had been taking during the break. To be able to catch up, today I will be presenting all my recent Chanel hauls at once. As I mentioned earlier, in Germany now we have chanel.de which is great news but there is some problems with the delivery company they are working with. I ordered Coco Codes Collection earlier than its release in Germany but it took more than 2 weeks to reach me. More about this and my feelings about the products I had been using are all after the jump. Here is the story. Chanel is working with the courier company called TNT. The package comes from France so it takes a few days until it reaches, to be precise around a week. Friday I came home and found a notice on my mail box that they were there and couldn't deliver the package because I wasn't there. Fair enough, I am working so I called and asked if they could come on weekend. Nope, they don't work on weekends, I told them to come on Friday because it was a day off for me. The man on the phone asked if I'd like it in the morning or afternoon, explicitly stating "between 12:00 and 18:00" so I went for that option hoping that I could maybe sleep a little longer. On Monday I wait until 18:00, no one comes. By the way, mind you I have to go and buy a few things but I can't because package might come any moment. After it was later, I called them to find out what happened. It turns out they brought the package at 8 am! I tell them my heart's content, which happens to be more of a complaint, they apologize and ask when can they come again. My next day off was Friday so we decide on afternoon. On Wednesday, someone calls me on my cell phone and tells me he is bringing the package now. I am like "Hey wasn't it Friday?" what a luck though there is someone at home so I arrange the delivery and take a deep breath. During the time I was at home, I ordered a few more packages and it was all fine with the delivery. It seems Chanel aims for woman who aren't working. *sighs* What a shame. I am meaning to call them on this issue and tell them to reconsider the courier service they selected. Maybe they take into account. Rant is finished, let me go back to the pretties I picked. The most pretty of them all must be the Highlighting Powder from Énergies Et Puretés Collection. I think that collection was much better than their Spring Collection in terms of nails (nail polishes reviewed here) and face. I was very happy to see that the item were all available online although during last years I had to order them from other countries, mostly Asia and North America. Plissé Lumière de Chanel Illuminating Powder is a very beautiful pale neutral champagne highlighter with lovely design and top consistency. 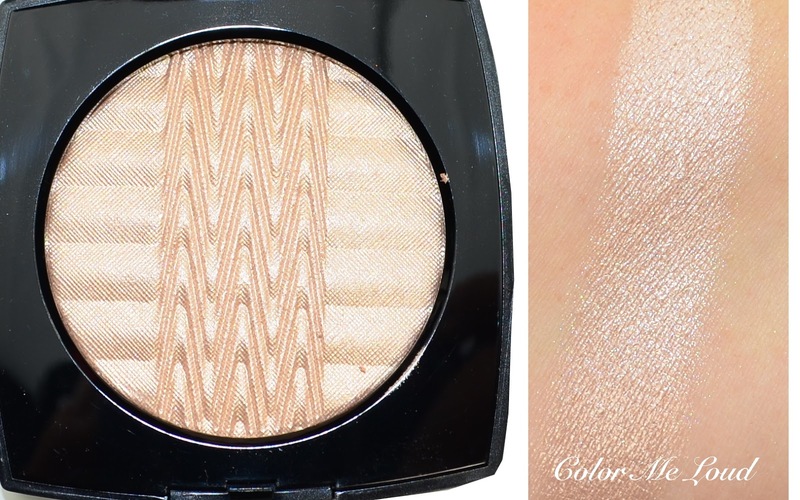 The shade and consistency are both very close to Armani's limited edition Belladonna highlighter (reviewed here). Back then it was said to be having an innovative "gel/creme" hybrid formula. Plissé Lumière feels exactly like that, it is not powdery, more like a gel, seriously beautiful and if you are a collector, something you shouldn't be missing. I haven't purchased any Chanel palettes since Tissé Dimensions (reviewed here) which was an absolute fail for me although I love the ones that are permanently offered. For Chanel Les 4 Ombres #278 Codes Subtils I have mixed feelings. It is fine when switched but on the eyes it turns out to be rather subtle. I got it sight unseen so the shades are also not very flattering for me but the end look is not so bad, probably due to the subtleness of the colors, hence the name. Here is an eye look using Chanel Les 4 Ombres #278 Codes Subtils. You can see that it is good natural quad with everyday shades that doesn't look as intense as the finger swatches above. Below I applied the pale pink on the inner corner and blended it towards the mid of the lid. I then added the copper on the lid and accentuated the eye with the deep black shade. But my favorite of Chanel Coco Codes Collection is the combination of Joues Contraste Blush #370 in Élégance and Rouge Allure Velvet #62 Libre. These are both rather unique and they go so well. I am a lover of Chanel Rouge Allure Velvet and #62 Libre is one of the most beautiful shades I own in this formula. Below I sm wearing Chanel Les 4 Ombres #278 Codes Subtils on the eyes, Chanel Joues Contraste #370 Élégance and Plissé Lumière de Chanel Illuminating Powder on the cheeks, Rouge Allure Velvet #62 Libre on lips. #370 Élégance is such a delight, I can't get enough of it. Look how neutral, yet unique it looks. Big love. Chanel Blush Harmony Coco Code is a lovely blush I purchased more for looking that really using. I think the formula and the shade of Élégance is more beautiful but I can understand the demand for this one too. It looks beautiful. Mixed together it is a lovely shade for Spring as well as Fall. Here is the full face with Chanel Les 4 Ombres #278 Codes Subtils on the eyes, Chanel Joues Contraste #370 Élégance and Plissé Lumière de Chanel Illuminating Powder on the cheeks, Rouge Allure Velvet #62 Libre on lips. I seriously have a crush on this lippie and blush combi. If your coloring is close to mine, you might love them as much as I do. Also loving this blazer I am wearing from Giorgio Armani. I learned to buy less make up and more clothes from the Maestro because recently none of the Armani Collections excited me. Have you picked anything? Final thoughts: My favorites pieces I picked up are the beautiful combination of Chanel Joues Contraste #370 Élégance and Rouge Allure Velvet #62 Libre. Plissé Lumière de Chanel Illuminating Powder is one of the best highlighters release recently and comes in a beautiful design, make sure to check it out. Have you picked up any of these as well? Loving something else from Chanel's seasonal collections? I'd love to hear that. Disclaimer: The products in this post were purchased by me. I am not paid for this review. I love the look of Plissé Lumière, but I decided to pass on it as I already indulged by purchasing the Camellia highlighter. Plissé Lumière would've been more suitable for my skin, being pale and softer in your swatches, but the embossing got me.. That delivery story sounds so annoying, we have had similar problems with deliveries in Finland when it comes to some companies. I tend to avoid those couriers at all cost if I can. Phew!! I am so glad you found Plisse de Lumiere as beautiful as I did! And Elegance blush is such a winner!! I too prefer it over the Coco Codes, but the other is a collector's item so I understand. Let's hope chanel.de improves their delivery soon!! You are right Amalia, most of these are dupable. Still I love the blush and lipstick duo. Yes and it was you who told me I should get it, so thanks so much. Elegance is such a pretty shade. I think Chanel should change the courier they are working with and it is only possible if we give feedback. I missed the Camellia highlighter which was also available online but at the time I saw it, it was sold out. It reminded me of the bronzer they released a few years back but I'd love a highlighter with the same gorgeous pattern too. Some Courier companies work really lousy but this one was beyond comprehension. I also can't understand that they don't work on the weekends and not have a depot where I can pick it up myself. If you work everyday, it is impossible to get the package. That makeup combo looks beautiful on you, very spring like. The only item I bought from Chanel spring is the Elegance blush. I really like it. Over here we also have problems with some couriers, so I understand what you mean. Hopefully Chanel will listen to its customers. These look gorgeous on you Sara, and your hair got so long! Beautiful!! Thanks for the review Sara. I got the eye palettes from the Coco Codes Collection and the liner in Petrol Noir which I'm obsessed with! I skipped everything else but I'm loving the two quads so much. They might be dupable, but they're the kind of colour I love to wear and can't have enough of. What do you like about Petrol Noir-- I've been curious about that one? Great photos-- and your look wonderful. I'm surprised to find myself liking Elegance-- on me that would almost be a bronzer. Thank you, Elena. I checked out your blog -- which is lovely. I also found myself at a counter, and swatched the collection. (They were out of the JC Elegance sadly.) I decided that Noir Petrole is too warm for me. Purple Choc and Feuilles are my favorite YS's-- and I cannot wear browns and golds as well as you can-- ha-ha.